Half-term is upon us already so here is a perfect craft activity to keep your children occupied for a while. They’ll love the finished bowl too, and it can be used for so many things. Halloween is round the corner so this would make an ideal container for all the yummy treats and sweets. You could make it with just orange paper and make it look like a pumpkin. Or how about a gift for a teacher at Christmas? I used to work in the Reception class of a local primary school, and had so many gifts at Christmas and end of the school year. The handmade ones were always my favourites. They were more personal and unique, and I still have them now all these years later. 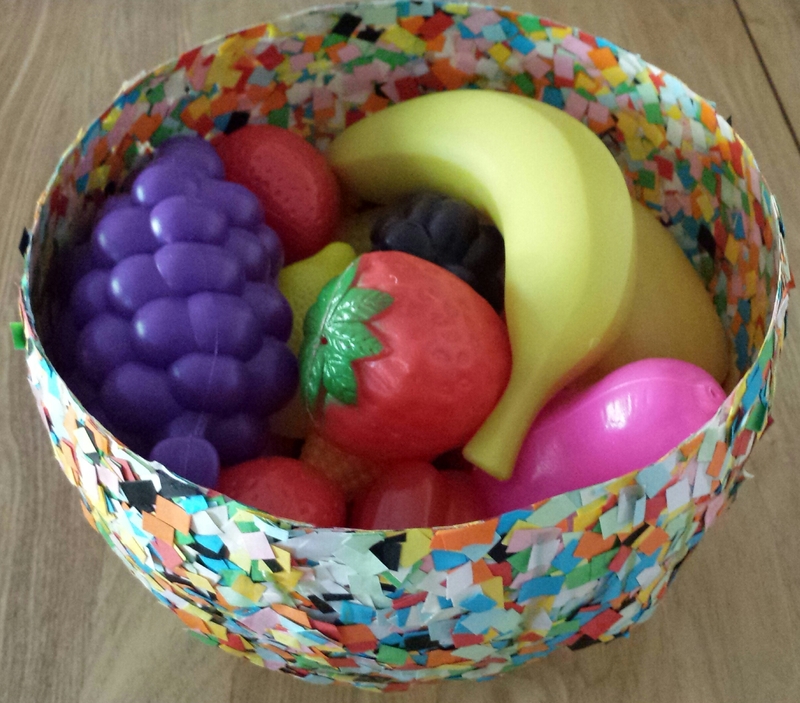 Your child could make a small version of this bowl and put a few chocolates inside. The possibilities are (almost) endless. My son made the one in the picture and uses it to hold some of the play food in his play kitchen. It is very messy to make, but that makes it extra fun! Just put lots of newspaper or a mat on your table to protect it from dripping glue! 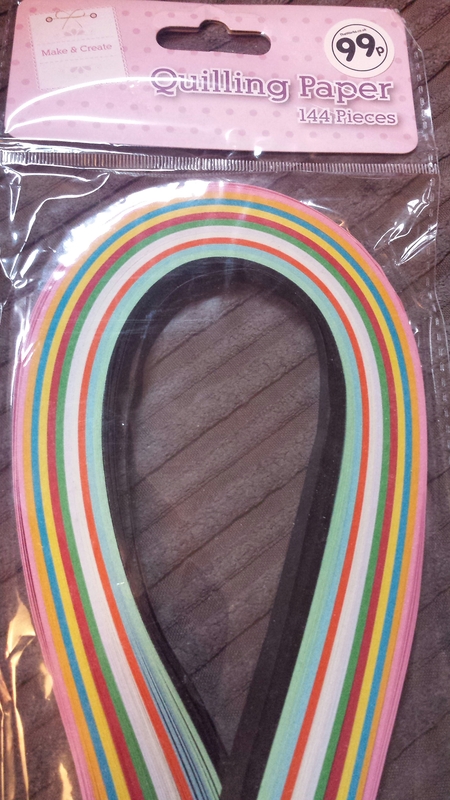 To make it, blow up a balloon to the required size. Luke wanted a big one so we inflated the balloon to its maximum size. Cut up lots and lots of paper into small pieces. You can use any paper you want, but we cheated and used quilling paper from The Works. It is ready cut into strips so it is a lot quicker to cut into pieces. (I was going to put the link up for it but I can’t find it on their website now. I’m sure other places sell it too, or just cut up sheets of paper). 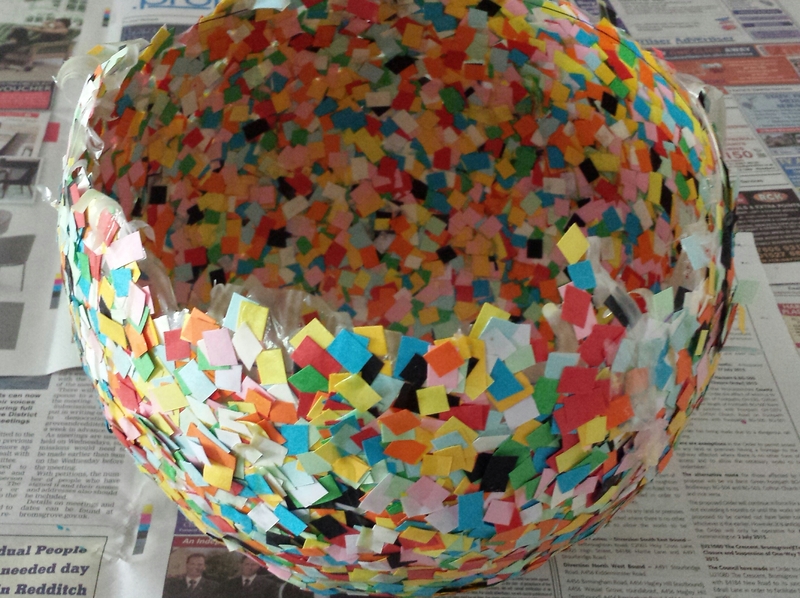 Use a paintbrush to cover your balloon with PVA glue to the height you want the bowl. Hold it by the knot to do this and cover the other end with glue. 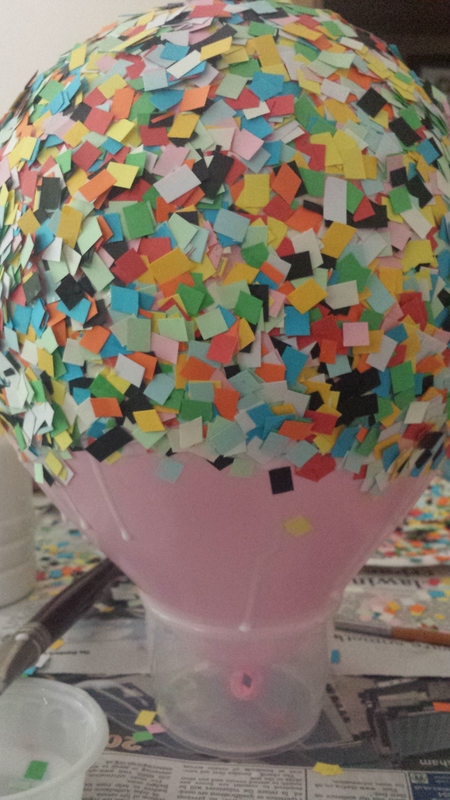 Stick pieces of paper on until all the glue is covered, and rest it on a cup or container to dry. This will take a couple of hours. Luke had fun peeling the glue off his hands at this point. Remember doing that when you were at school? Ah, happy memories…. When it is dry, cover all the pieces with another layer of glue, and stick more paper on top. 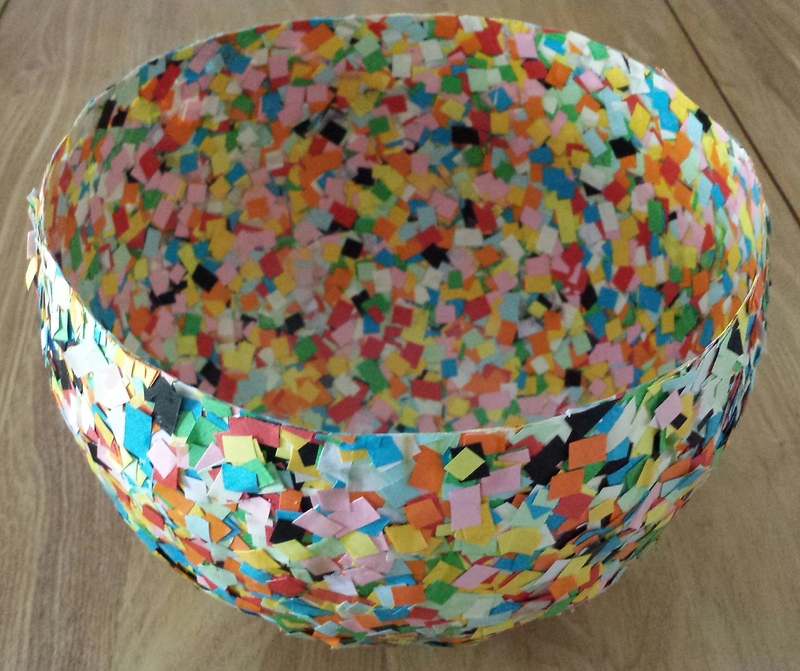 Repeat this process of drying and adding more until your bowl is nice and sturdy (at least 3 layers of paper pieces). Cover it all with glue again and leave to dry. The final layer of glue will protect it and make it stronger. It will dry see-through and will make the bowl rigid. When it is dry, pop the balloon gently and peel away from the bowl. You’ll now have a very rough shaped bowl. This is the trickiest part so best for older children or adults to help with… carefully cut around the edge to make it a nice tidy bowl. I’d love to see your finished bowls if you make them with your children. Happy crafting! That’s a great idea!! My daughter would love to do that! Thanks for the inspiration! !